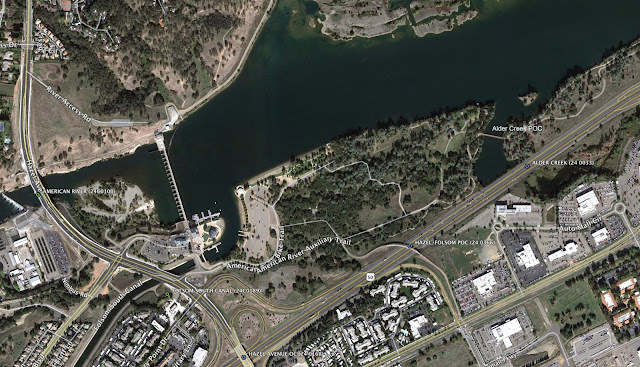 As an alternative to taking the Alder Creek Bridge onto the American River Bike Trail, riders can take the Hazel/Folsom POC (24 0366) over US-50 instead (see Google earth photo below). This bridge was built in 2000. I wonder how they managed to build the falsework over this busy expressway? It's a continuous cast-in-in-place prestressed concrete box girder bridge. It's a 390 ft long bridge composed of three spans on a sharp horizontal curve. Providing safe bicycle corridors as alternatives to streets and highways may not be cost-effective since thousands of people drive while hundreds of people ride. However, affluent communities are very willing to make the investment. Sacramento County, California Bridges: Hazel/Folsom POC across the American River by Mark Yashinsky is licensed under a Creative Commons Attribution-NonCommercial-NoDerivs 3.0 Unported License.